After more than two months, having been in 'no man's land', I come back with a recent, well no so recent play, that I had the opportunity of watching last October during my two week stay in London. 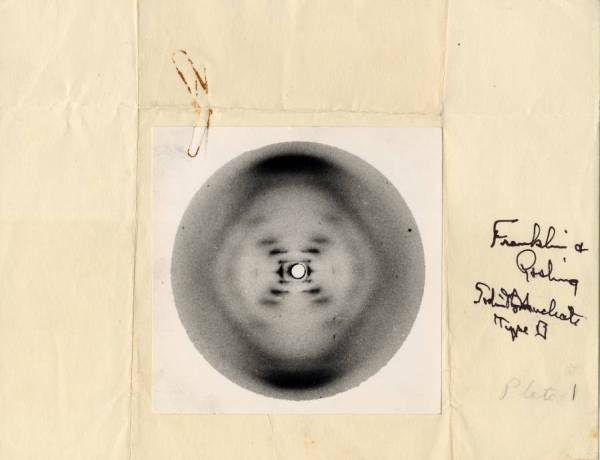 The DNA double helix, photograph taken by Rosalind Franklin at King's College in 1952. The play's name, this time, PHOTOGRAPH 51. Well, you may be asking yourselves whether this is the name of a play or of a picture taken somewhere at some point. The answer is no more than both things at the same time. Apparently Anna Ziegler, the playwright, chose this name after a picture taken by Rosalind Franklin at King's College in the 50s, when London was the main target of the II World War. However, the lines writen above may not give much information to those who are not related to science and don't know anything about the woman who discovered the DNA, well not the DNA but its functional structure (the well-known double helix), Rosalind Franklin (if you would like to fill your brain with new information about her life, do not hesitate to click on her name). As a scientist Rosalind contributed substancially to Science and after her death, she was given the recognition she hadn't been given before. The play is no more than her story, marked by her irresistible taste for what was perceived as a man's profession and her willingness to do something relevant in life. The play is basically focused on the moment when she takes the picture, which she names Photograph 51 as a series of pictures taken up to that moment, and how both Watson and Crick try to do their best to steal information from other laboratories to find out the real structure of this molecule. Nicole Kidman brings to life one of those people whose life was marked by something more than brilliance, a life also defined by an incurable disease and a sickly childhood. Doubtless, PHOTOGRAPH 51 is more than worth watching. Specially for those who have never heard of this brilliant woman.